Local authorities (LAs) in England are required to conduct the Adult Social Care Survey (ASCS) and the Personal Social Services Survey of Adult Carers in England (PSS SACE or Carers Survey) as part of their annual data returns to NHS Digital (formerly, the Health and Social Care Information Centre or HSCIC).1 The data from these surveys are used to populate indicators in the Adult Social Care Outcomes Framework (ASCOF), which are used by central government to monitor the quality of social care, and can be used locally by LAs to inform local social care-related planning and service/performance improvements. While LAs generally support the ASCS and PSS SACE, informal feedback indicated that staff from all groups and within many organisations were not engaging with the surveys and/or were making limited local use of the data. The Maximising the value of survey data in adult social care (MAX) project was set up in 2012 to further explore these issues and to develop appropriate support. 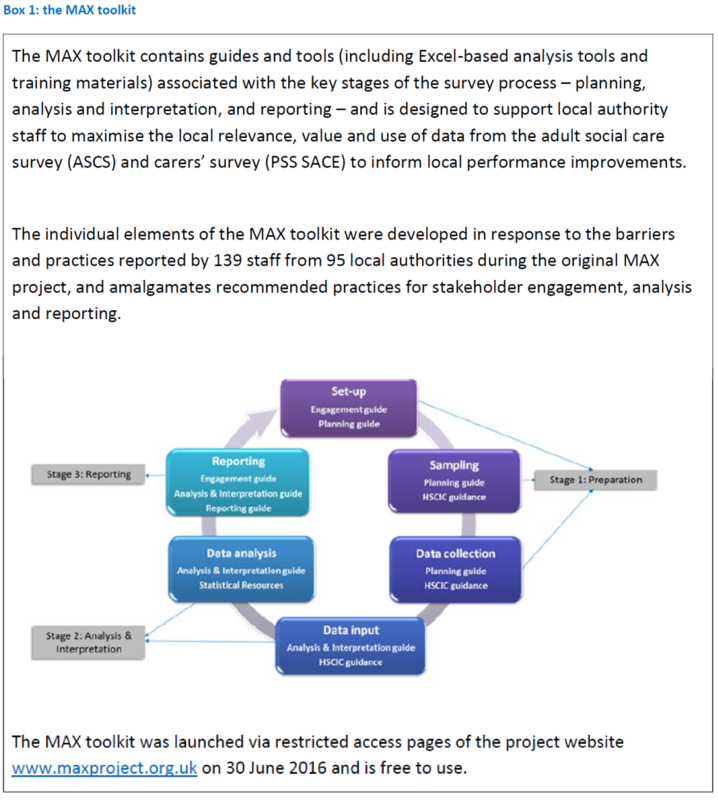 The feedback collected during the project research activities and consultations with LA staff led to the development of the MAX toolkit (see box 1 below). is using the toolkit – through a range of activities and consultations. practice improvements as a result of using the toolkit. form in the MAX toolkit. examples will also be co-authored with collaborating LA users where possible. Karen Jones, Clara Heath and Diane Fox. 1Please note that the ASCS is conducted every year, while the PSS SACE is conducted every other year.